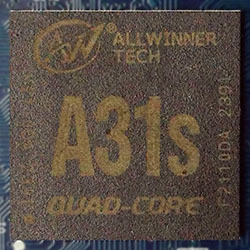 Allwinner A31 (sun6i) SoC features a Quad-Core Cortex-A7 ARM Processor SoC, and a Power VR SGX544 (with 8 shader engines) GPU from Imagination Technologies. A31 powered by 4 CPU and 8 GPU (Power VR SGX544 for Ployer and Power VR SGX544MP2 for Onda). A31 CPU architecture consists of quad ARM Cortex-A7 cores to deliver decent computing capability while consuming less power, and integrates the PowerVR SGX544 GPU. It also features Cedar Engine multimedia processing unit that is capable of up to 2160p ([email protected] 4k resolution or 1080p 3D decoding) video decoding, with integrated HDMI 1.4 output support, and H.264 HP (High Profile) in 1080p at 30fps video encoding. Proper Linux support now difficult for A31 due to the Power VR GPU, though; however, its kernel source is available now and also for U-boot. The A31s is the same die as the A31 in a different package. In terms of hardware specification and functionality they are identical. The A31 was initially rumored to be called the A40 instead. On July 9 cnbeta.com and chinaeshops speculated that the next SoC from Allwinner will be a Quad-Core Cortex-A7 ARM Processor SoC, and twice as many GPU cores as it has CPU cores, (it was also unclear early on which GPU it would had, and rumors speculated on Mali 450, Mali T604, or Mali T658 GPU). "This new SoC was thus most likely be either called Allwinner A40 if the pictures from iLife Tech banners taken at Hong Kong Electronics Fair 13-16 October 2012 are correct". "It's look like Veda confirm the rumor with a tablet, Veda X75, which include an A40 (Quad-Core / 8GPU)". Onda V972, a 10-inch Android tablet, was the first device to be publicly announced to come with an Allwinner A31 SoC. The publically available SDKs contain kernel and u-boot trees which include and depend on several binaries. Allwinner is violating the GPL quite directly here. bamvor, ojn, drachensun or mripard own an A31-based board. There is no support for the A31 and the A31s in u-boot-sunxi and in the linux-sunxi 3.4 kernel, but both mainline u-boot and the mainline Linux kernel have basic support for the A31 and A31s (cf. the respective links for further information). This page was last modified on 7 February 2018, at 17:42.